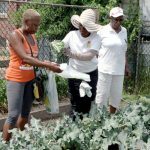 The Schoolyard Gardens program at Kansas City Community Gardens works with preschool through high school students in the Kansas City metropolitan area as an introduction to vegetable gardening for students. By partnering with area schools and after-school programs, we give students the opportunity to see food production from the earliest stages. Schools enrolled in our program involve their students at the onset of the garden. Students construct the cedar-raised beds with hammers and nails, and use wheelbarrows and shovels to fill the beds with nutrient-rich soil. Often times this is a student’s first introduction to working with these materials. After the garden is built students work together to choose which vegetables to grow in the garden. Schoolyard Gardens focus on teaching students about healthy food choices through exposure. Students who work in the garden and are familiar with their plants and vegetables are more likely to choose healthy food options. Gardens teach students about healthy vegetables and fruits. With some encouragement to try lesser known vegetables such as kale and sugar snap peas, the gardens excite students about snacks that they themselves have brought to the table. We are encouraged every day by the excitement the students show for the garden, such as a Primitivo Garcia 1st grader, who chowed down on okra like corn on the cob, or the Woodland Early Learning Center students who performed their end-of-summer school play about the enormous potato, inspired by their harvest of potatoes and teamwork in the garden! donated to local food banks. Many schools integrate parents by providing tastings and showing off their harvest at parent nights. Many LINC after-school programs host Lights On events each fall that involve parents in the garden successes. Beyond the nutritious benefits of the garden, the Schoolyard Gardens program enhances school environments in a number of other ways. School gardens allow students an opportunity to enhance their curriculum through hands-on science and math, and other core subjects. They give students an opportunity to be outside and active. The students become aware of the environment around them through watching the garden grow and through their civic interactions with their surrounding community. Students take pride in their work in the garden, because they have ownership of the gardens, and the gardens create an aesthetically pleasing environment on school grounds. 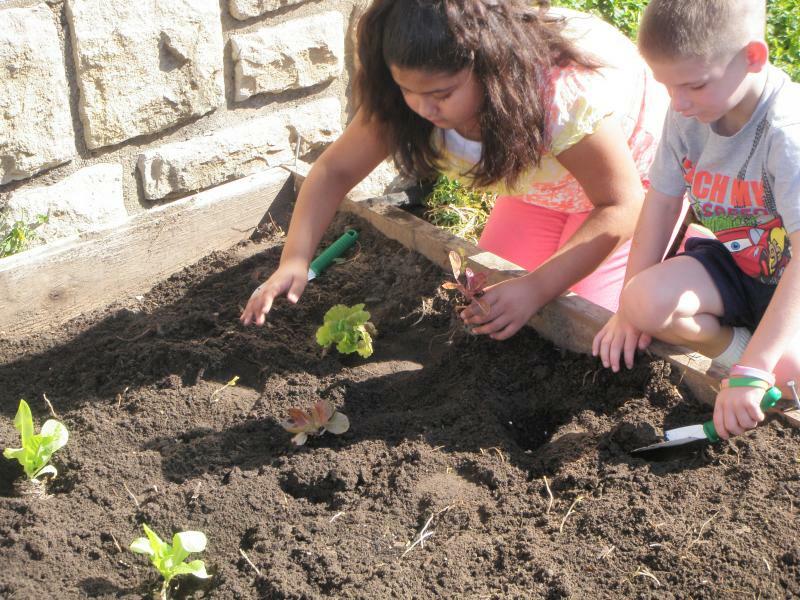 The overall goals of the Schoolyard Gardens program are to improve students’ health and reduce the risk of obesity by increasing their consumption of vegetables and fruits; and to integrate gardening into school facilities and curriculum throughout the Kansas City metropolitan area. Enrolled schools receive Schoolyard Gardens staff support, seeds, low-cost plants, tools on loan, garden consultation and planting assistance, and teacher training. Our vision is one in which every school has a garden; where gardens are as common in schools as playgrounds, libraries and classrooms. 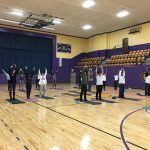 With more than 175 schools and counting enrolled in the program we are well on our way to creating a fit and healthy school experience. A garden for every school!